A chocolate-sandwich-cookie crust is layered with peanut butter, sliced bananas, chocolate pudding and whipped topping for a decadent no-bake pie. Crush 22 of the cookies; place in medium bowl. Add margarine; mix well. Press onto bottom and up side of 9-inch pie plate. Refrigerate 30 min. Spread peanut butter onto bottom of crust; top evenly with bananas. Add milk to dry pudding mixes. Beat with wire whisk 2 min. or until well blended. Pour over bananas. Refrigerate at least 2 hours. Top with the whipped topping and remaining 8 cookies just before serving. Store leftovers in refrigerator. 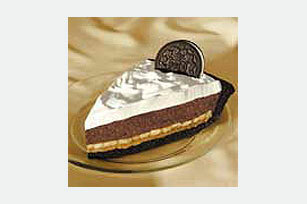 Savor one serving of this special-occasion dessert. Each pie makes enough to serve 8 people! Prepare as directed, using crunchy peanut butter.